A warm and friendly hospitality with tastefully furnished rooms, a mere 6 km form the Kruger National Park, 28 km from Swaziland border post, 50 km from Mozambique border. Game drives in KNP or private game farms with prior bookings. Walking distance to banks, shops and restaurants. 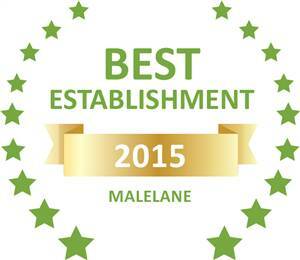 Based on reviews of establishments, Bezuidenhout BnB has been voted Best Establishment in Malelane for 2015. Twin en suite rooms with 5-channel TV, air conditioning, mini fridge, complementary coffee / tea. Fully equipped 2-bedroom self-catering cottage (1 to 4 persons) plus R80 p.p. if more than 4 (Can sleep 6). Note: All prices does not include Breakfast. Bezuidenhout B&B and Malelane Accommodation is situated in the Mpumalanga province. 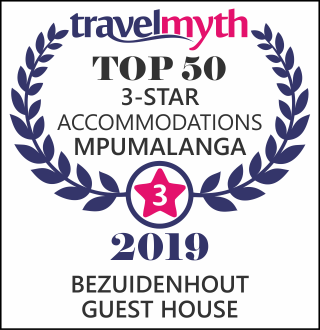 Our B&B is the best bed and breakfast accommodation in Malelane and us, Bezuidenhout B&B makes sure we provide excellent and efficient service for your stay. Malelane is a beautiful area in Mpumalanga and our Bed and Breakfast has known to be the best B&B Accommodation in Malelane. Wheather its business or pleasure ... Bezuidenhout B&B is set in a lovely venue and our Malelane Accommodation is very affordable.